by Mark — in Mac Apps, Reviewed.Leave a Comment on Jaksta Video Convertor For Mac : Convert videos in minutes rather than hours? 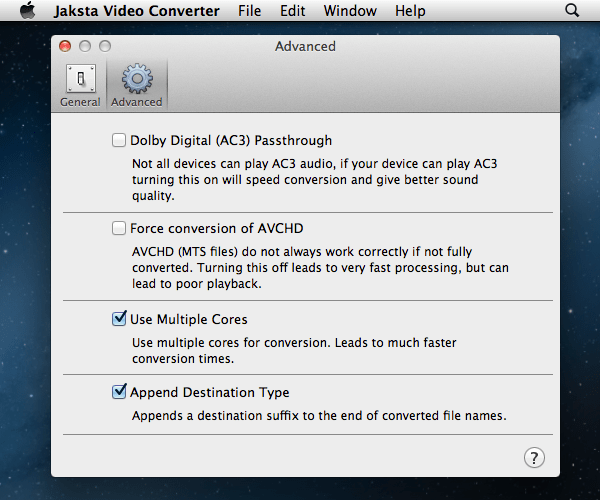 By intelligently matching the format of the source video and target device, Jaksta Video Converter for Mac chooses the best possible conversion path. In many cases, a one hour video can be converted in two minutes or less, compared to 60 minutes or more with other converters. Now that’s a claim and a half. So before we get to testing lets have a look at the program itself. Immediately you’re presented with an interface that really is simplicity itself with only the icons on the screen to select from for your target device. Delving into program preferences you can tinker with a couple of the of settings such as a minimum of CPU cores to use and if you want to send the converting files directly to iTunes or not and that’s that for the program preferences. There is an almighty amount of pre-sets to choose from, covering pretty much any main streamdevice. Apart from the standard Apple based devices you can also convert for Xbox, PlayStation 3, Google TV, Logitech boxes, smart tv’s or simply convert the video soundtrack to an audio file. Disappointingly there isn’t an option to set up custom video resolutions or some of the more advanced features available in other programs but that’s not the main USP here but a nice custom feature to addd a resolution or encoding output would of been nice. Like I said earlier the most interesting aspect of this program is the smart conversionfeature and I wanted to test this alongside with the other conversion speeds. When files are added to the queue you get to see an indicator of how long an encode will take and if you can use the smart conversion feature. Speed depends if it’s a simple transcode, audio only, video only or the full month, this is going to take a while, conversion. Before testing I wanted to be sure I had the right stuff to test out this feature, so sent off an e-mail to the developers asking under what circumstances a a smart conversion would take place as this what most will be interested in. It would of been nice to have a codec run down on the website so people know what to look out for when “archiving” videos and perhaps tailor their video sources to accommodate the transcoding process. Mp4 files that already played in iTunes came up as the fast option although why you would want to transcode a file that already works I’m not entirely sure yet this came in VERY handy when the deadline for posting the podcast arrived. I was sent a copy of our latest podcast which ended up being an MP4 format. Although I could drag and drop this file into iTunes it steadfastly refused to go onto my iPhone. Using the smart conversion feature 20 seconds later I had the podcast playing on my iPhone so yes it worked but not how I thought it would but a win is a win. Normal file conversions are pretty much of a muchness as the back end is powered by the ffmpeg engine (as used in handbreak) with encoding times being dependant on hardware. It’s times like this I’m long overdue a hardware upgrade and there was no difference in encoding tests between this and the obvious competitor. Jaksta is über fast in the right conditions and priced at 12.99 it’s more than reasonable for the mainstream market who don’t care about how videos are converted, interlacing, variable bit rate encoding and the rest of it, they just care it’s a file can be played on their device with the absolute minimum of fuss. The true video converting aficionado’s put there will come out with the obvious objections but it’s clear this app isnt in the targeted customers list. I’d have liked to know more about the conditions to trigger a quick or medium encode as I’m between both types of user but yet again it’s a product that’s aimed at a definite market so it’s hard to fault on that. So the only fault I can find is that if you know what you are doing there are the usual free candidates out there but they lack the transcode options of Jaksta. Jaksta is £12.99 and if you want something simple and does the job, it’s recommended for those who want something easy to use. Previous Previous post: Reviewed : iKeyboard – Making typing on the iPad that little bit easier?